Many companies ask themselves this question when starting an App project: Should we develop a hybrid or a native App? You can guess the answer: there is no option. It depends. There is no closed-response; we need to choose the most suitable option for each project. If we plan to construct a building, we do not surely begin with the question “Should we build it in glass or in concrete?” First, we would hire an architect to carry out a project based on its future utility, who is going to use it, the environment in which it would be constructed, define the number of flats, etc. A technological project must also start by analyzing the needs to be covered, the goals to achieve and the public to which it is aimed. Conceptualize the project thinking about the needs and goals, not about the technical architecture. The best exercise to begin an App project is to draft the analysis of requirements, by highlighting the features and services that you want to offer through a mobile application. With the described features, you can display the screen outline, which should have the perfect technical application and architecture for its development. With the global view of the project to be developed and by examining the differences between hybrid and native Apps, we can choose the most suitable option. 2. Execution and answer speed. 3. It make the most of the device capabilities. 4. Offline functioning and information search. 5. Asynchronous synchronization with the server. 1. Lower investment in development. 2. Reduces the ‘time to market’. 3. Maintenance of only one source code. 4. Update of interface and features without using App Store or Google Play. 1. Greater investment in development. 2. Maintenance of 2 source code. 1. It does not offer the best user experience. 2. Greater dependence on internet connection. 3. Lower execution and answer speed. 4. It accesses the device capabilities trough plug-ins. 5. Possible problems with used in Apple. 1. Apps focused on utilities. 2. Optimization of industrial/business processes. 3. Improves the client’s experience based on hiring and loyalty processes. 2. Access to business information. 3. Launching of product test to the market by reducing investment. 4. User with guaranteed internet connection. 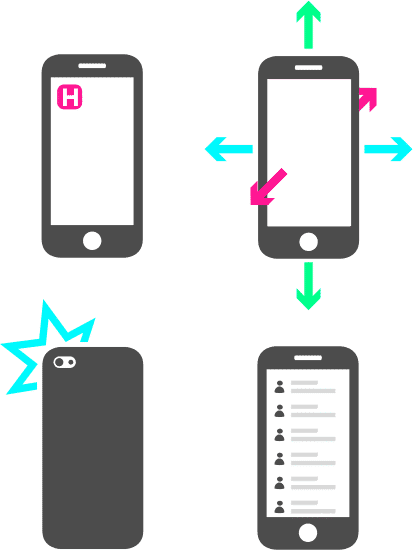 This hybrid development allows, on one hand, the use of some hardware features of the mobile device, such as the accelerometer, camera or contacts, which are functions that often have restricted access from mobile browsers. And, on the other hand, they can simulate, in some way, the user’s experience, since a hybrid app will appear as any other application that you can find on your smartphone: they are installed on your device and you can find them in the app stores. It should be noted that Apple must revise and approve the application in order for it to be distributed in the App Store. Providing that Apple’s usability and functionality guidelines are fulfilled, the review process should be positive, but Apple always promotes the development of native applications in iOS. This means that they are much more demanding in terms of the user’s experience when referring to hybrid applications. However, we will not find any problems on Google Play when publishing the application. A hybrid application is independent from the operational systems of iOS and Android. It is created with a HTML5 core and a sole interface. It is subsequently compiled into a native container to be launched through all platforms. This reduces the project’s initial investment and, on a mid to long-term basis, it does not require the maintaining of two different code bases. The disadvantage of these hybrid applications is the user’s experience, a key factor in the success of a project. The loading speed of a hybrid App is much slower than a native App. Since it is web content, the answer time is also affected during navigation through the App, as well as the usability that can be offered by a sole interface design. According to Google, 50 % of users will close the application if it does not open within 3 seconds. Another disadvantage is the integration with device features which, even if they are feasible, will never operate with the same fluency as in a native App. When should a hybrid App be developed? It is recommended to choose this option when the app is focused on projects related to news, media and distribution of content, those that the user is more used to waiting for a few seconds until it loads to access the content. And in general, for projects in which the user is likely to be used to waiting a few seconds to access the information, such as in applications for corporate use or for a segment of users who are very loyal to the brand. This option is usually selected when you want to launch a concept test to the market, trying to reduce the initial investment and time to market. Even though the hybrid option fulfills these two premises, the risk exists of offering the users an app which does not offer a user’s ideal experience. These applications are developed in the native language of each operating system. It is the safest option to ensure the best possible user experience, with full access and integration with the hardware functions of the device and native APIs, much shorter response times and full utility without connection to the internet. In other words, the original investment can be greater, but a company will save time and money on a long-term basis, offering a great user experience and an ideal performance of the application. When should a native App be developed? This option must be chosen a priori providing that the company prioritizes quality and user experience over investment and time of development. 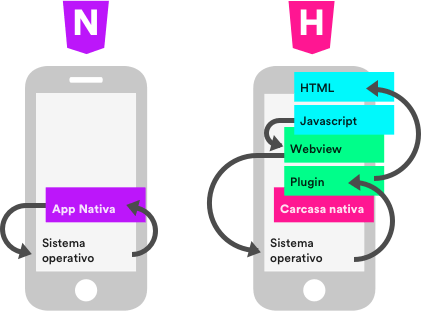 Native development will imply a greater budget than hybrid applications, since it takes into account a budget for iOS development, a budget for Android development and also a common interface design budget (with nuances and adjustments for every operating system) and backend.